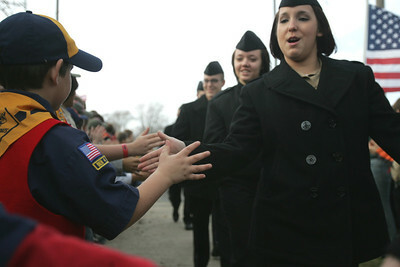 Monica Maschak - mmaschak@shawmedia.com Navy Gunner's Mate Kristina Lancelotte (right), and other sailors, high five a line of scouts who greated them at the McHenry VFW Post 4600 on Thanksgiving day. 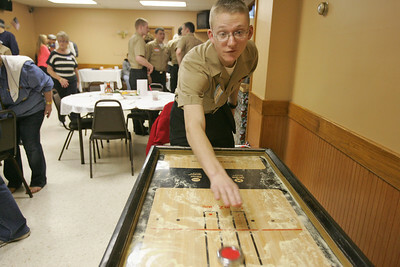 Monica Maschak - mmaschak@shawmedia.com Navy Engineman Fireman Recruit Keenan Kotanen plays an arcade game at the McHenry VFW Post 4600 while waiting for the Thanksgiving meal to be served. 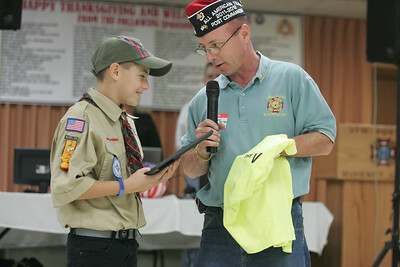 Monica Maschak - mmaschak@shawmedia.com Fifth grader Presley Diakow, 10 (left), accepts a plaque and t-shirt from VFW Post 4600 commander Ronnie Reber after collecting donations of 73 turkeys and 24 hams for the Great Lakes sailors who spent their Thanksgiving at the McHenry VFW. 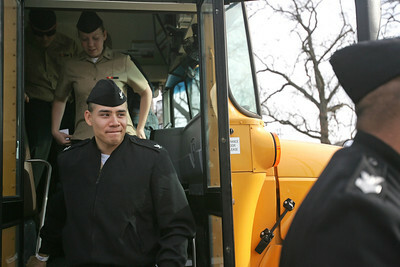 Monica Maschak - mmaschak@shawmedia.com Navy Fire Controlman Vladimir Rivas steps of the bus at the McHenry VFW Post 4600. Rivas was one of about 150 sailors from the Great Lakes Naval Base at the Thanksgiving of Sailors hosted by the combined veterans organizations of McHenry. Monica Maschak - mmaschak@shawmedia.com Polish Legion of American Veterans members Mike Peterson (left) and Jim Valley check the temperature of a deep fried turkey at the VFW Post 4600 in McHenry on Thanksgiving day. Seventy-three turkeys and 24 hams were cooked for the sailors of the Great Lakes Naval Base. 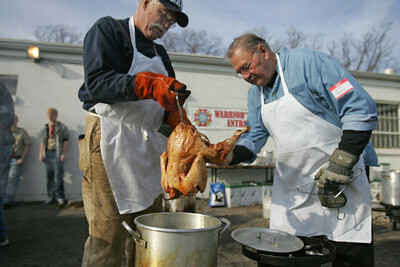 Polish Legion of American Veterans members Mike Peterson (left) and Jim Valley check the temperature of a deep fried turkey at the VFW Post 4600 in McHenry on Thanksgiving day. Seventy-three turkeys and 24 hams were cooked for the sailors of the Great Lakes Naval Base.